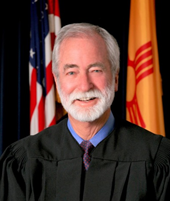 The New Mexico Administrative Office of the Courts reports that Justice Charles W. Daniels was sworn as Chief Justice of the New Mexico Supreme Court for a two-year term on Monday, April 11, 2016. He previously served as Chief Justice from 2010 to 2012. Justice Daniels was selected for the position by his colleagues on the five-member court. He succeeds Justice Barbara J. Vigil, who had served as Chief Justice since 2014. The Chief Justice performs both court and administrative duties. In addition to presiding over Supreme Court hearings and conferences, the Chief Justice serves as the administrative authority over personnel, budgets and general operations of all state courts and acts as an advocate for the Judiciary on legislative, budget and other matters. Justice Daniels joined the state’s highest court in 2007, after a career of more than three decades as a lawyer with a courtroom practice in both criminal and civil cases. He also had been a faculty member at the University of New Mexico School of Law. Justice Daniels was born in Arkansas but grew up in New Mexico. While serving on active duty in the Air Force, he was inspired to pursue a legal career after reading a biography of the famous trial attorney Clarence Darrow. He received his Juris Doctor degree from UNM in 1969, graduating first in his class, and a Master of Laws from Georgetown Law School in 1971. Justice Daniels and his wife, attorney and author Randi McGinn, have four daughters, four grandsons and three granddaughters. His interests outside the law include playing bass guitar in a blues-rock band and vintage car racing.